Despite still, somehow, being a big Star Wars fan, and also one who appreciates the work that goes into the lore behind a BioWare game, you'd think I'd have been first in line playing Old Republic. But nope. Couldn't stand it. Which was a shame, because the game's official encyclopaedia, which I was sent last week, is terrific, and serves as a constant reminder of all the deep storylines and art and detailed worlds that I'll never ever see, but can now appreciate regardless. It's a funny book. It's not really an art book, because much of imagery consists of in-game images and models (though there's still plenty of concept art). It's not really an encyclopaedia, because it's not just about lore; it's as much a player guide as a reference book. And it's not really a player guide because it doesn't deal in specific tips, just general guides to locations. So it's going to be of most use to players of the game, then, but seeing as Star Wars is a universe familiar to most, there's nothing stopping even someone who's never played the game to pick it up and know what's going on. Indeed, it can almost work in the opposite direction. 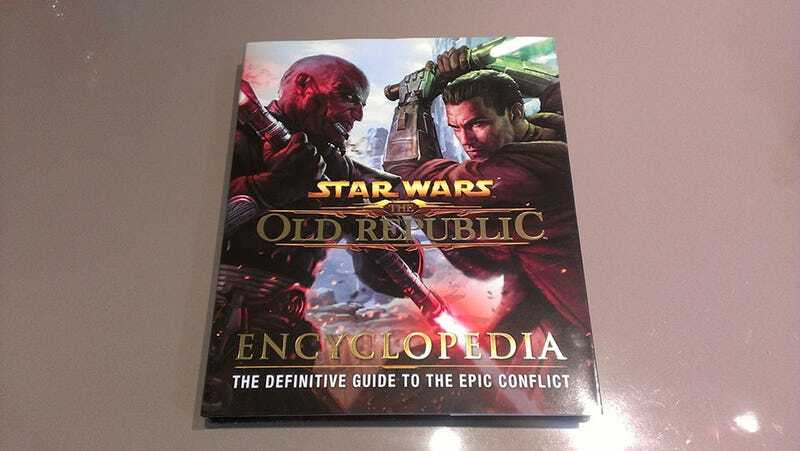 There's a ton of cool stuff in here, especially on the history of the current conflicts raging the galaxy and of the Sith that makes for good reading; you've got to wonder whether coming out with this stuff first might have hooked Star Wars fans into playing the game. It also makes you a little sad to see the state the game is in at the moment; there's just so much love and work that's gone into building these worlds and the stories you play through on them, it's a shame to think so much of it will go unseen and never experienced because the game they're a part of hasn't exactly been the blockbuster hit it was supposed to be.